The event EICMA Motorcycle Show 2013 be a event for manufacturer of the motor world to introduce its newest products, including Triumph, motorcycle manufacturers this from England also introduced a special edition products, Tiger 800XC Special Edition with color cast more aggressive. Wrap the black color and the red color on the tubular chassis makes the figure Tiger 800XC Special Edition looks more manly, moreover to make it look more aggressive on the exhaust cover, radiator guard and stirrup iron whitewash with black color. 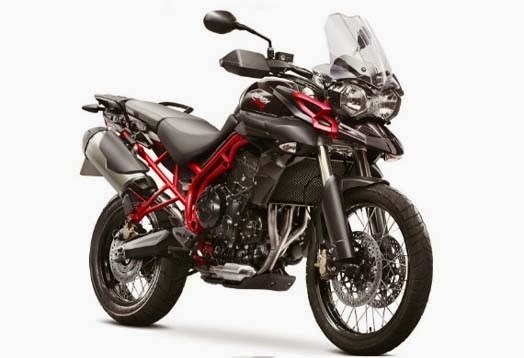 The meantime, Triumph also features modern pinned on Tiger 800XC SE such as application switchable ABS brakes, front suspension up side down to travel the length of the Showa. As for the engine, Tiger 800XC Special Edition hold the engine 799 cc 3-cylinder engine capable of spewing power is 94 hp and 79 Nm of torque are routed to the 6-speed transmission.